Different jobs require different size chainsaws. While a large chainsaw can do most jobs, it may have too much power for smaller jobs, creating a dangerous situation. Plus, larger chainsaws cost more and require more maintenance than you want. However, a smaller chainsaw may not be able to cut down and buck up a large tree. Each size does have its advantages, so consider what cutting jobs will be required of it. Chainsaw engines vary widely in the amount of power they can deliver. Chainsaw torque is often measured in cubic centimeters, more commonly referred to as cc’s. This measures the displacement and size of the piston inside the cylinder. Chainsaws can range from 20 to over 80 cc’s, so the gap is wide. 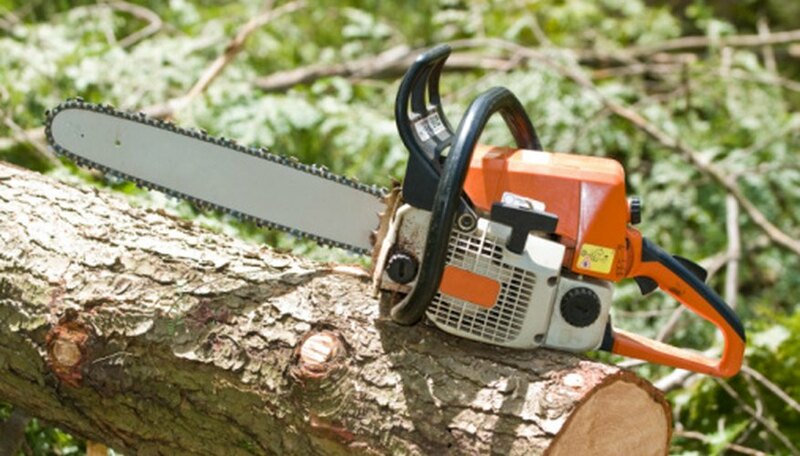 Most minor felling, bucking, brushing and limbing can be completed with anything under 55 cc’s; however, the larger your trees and logs, the more power needed to cut through them. Find out what type of trees are in your area; the harder the wood, the more difficult they will be to cut through and the more power you’ll want. For example, pines and firs are mostly soft woods, and cedars and deciduous trees are harder. With additional chainsaw power comes additional weight. This extra weight may burden and tire your arms. Tired arms create dangerous situations for the cutter. Striking a balance between the power to weight ratio is critical. Determine how long your cutting job is likely to last, how fit the cutter is and how much power is necessary to get the job done. Dropping the weight, however, doesn’t always mean losing lots of power. Some of the newer models are lighter than older or reconditioned models found secondhand. The cutting bar is an important factor in determining the size chainsaw you’ll need. If felling operations are required, a cutting bar at least 1 to 2 inches larger than the tree will greatly reduce the risk of injury to the cutter. However, if you’re cutting trees with a diameter at breast height that’s over 30 inches, it may not be ideal to operate with this large of a bar. Find a bar that is comfortable for you and still large enough to meet your cutting needs. Also, if you’re bucking those logs, a larger bar length will ease the process of cutting through the thicker logs. However, if you’re only limbing or brushing, a smaller bar under 20 inches will be adequate. Chainsaws are not toys and are inherently dangerous, causing a majority of all power tool accidents. Finding your comfort level is crucial in determining the size of chainsaw you’ll need. If possible, try testing out a friend or neighbor’s to get a feel for the power needed and your comfort level. More powerful and larger chainsaws bring a higher risk of kickback and injury to the cutter, so more experience will be required. Currently based in Minneapolis, Minn., Eric Blankenburg has been a freelance journalist since 2000. His articles have appeared in "Outside Missoula, Outside Bozeman," "Hello Chengdu" and online at GoNomad.com and various other websites. He holds a Bachelor of Arts in creative writing from the University of Montana. What Is a Reasonable Price to Trim Trees? What Is the Benefit of Two Blades Vs. One Blade on a Lawn Mower?